Men–Art–War is a self-published collection of ten philosophical short stories-stories, that is, which appear intended to illustrate the author’s Weltanschauung. Self-publishing seems destined to assume greater importance in American life, as the cultural gatekeepers become ever more ruthless to our people and traditions. We may hope the “vanity press” stigma fades accordingly. iUniverse, the company providing on-demand printing of the book under review, happens also to be responsible for keeping Kevin MacDonald’s A People That Shall Dwell Alone available since Praeger succumbed to pressure to drop his works. “Mikulas Kolya” combines two forms of the name Nicholas: Mikulas could be either Hungarian or Czech, Kolya is the Russian diminutive. A pen name, then. The author has previously published a novel called Going Nowhere, also with iUniverse, and is said to write from Los Angeles. He is evidently a young man, and Men–Art–War is not just a book by a young man, but for young men as well-young men who are beginning to sense the seriousness of life despite the culture’s lures of perpetual adolescence. Through clouded eyes we glimpse the cliffs that loom over yon distant shores. /The waves they break with giant’s strength and boom like oaken castle doors. /Lightening threatens from above while frenzied sharks await below. /Danger is all about. In every element lurks a foe. /Creation. Destruction. Birth and Death. The same. The same. The same. /Fire melts the eternal ice, which transformed, douses the flame. /Onward we sail, toward those cliffs, determined to reach the beckoning shore. /And on landing make what our fathers made-glorious art and glorious war. The author sees creation and destruction-art and war-as linked. Both arise from human nature, from life’s restless need to experience itself by overcoming obstacles and to understand itself by putting its stamp on matter. The drives are related, since it is war that creates the difference between master and slave, leaving the master the leisure to create culture. Both drives fall victim to excess. Warlike peoples are consistently undone by creating empires in which they then merge with conquered peoples. Culture gives rise to decadence, in which refinement and reflection hypertrophy and destroy their vital roots. Fortunately, these excesses are self-correcting. Decadent empires and cultures inevitably collapse, ceding their place to new, healthy, creative-destructive barbarians who will usher in a new Gold Age of gods, heroes, and vital art. History, therefore, moves in circles, and we who live in decadent times can sustain ourselves with the hope of eventual rebirth. 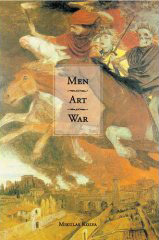 The tales in Men–Art–War fall into three rough genres: stories or war, art, and the pangs of rebirth. The stories in the last category deal most directly with contemporary politics and will have the most immediate appeal to TOQ readers. The penultimate story, entitled “The Stage Show,” is perhaps a good introduction to some of the author’s central concerns. The central character in the tale is an innocuous and unreflective man named Daniel Hoover. He takes little interest in the “Wanted” posters now springing up, even when a man in his own work gang is arrested and taken away. It turns out the man had formerly been a priest, a member of the denial caste. A few days later, Daniel accidentally comes upon the man’s corpse hanging from a tree. But this is not relevant to him, since he had nothing to do with the former rulers and had not done anything wrong. After the power holders and the denial caste have been dealt with, a category of persons known as “mouthpieces” finds itself the subject of the third round of purges. This class consists of all who had formerly been involved in communications media in any non-technical capacity. Actors form the largest contingent. And Daniel Hoover had once been an actor. As a young man, he had gone out to Hollywood, seeking his fortune. The apogee of his career had been appearing in a nationally broadcast commercial for Gadget Town, a popular retailer of consumer electronics. Enjoying no further success, he gave up after a couple years and returned to his Midwestern home. Later, during the years of war and famine, he had once survived by stealing food from a child. But it was the commercial for which he might now have to answer with his life. One day he is standing in line at a farmers’ market, hoping to barter for some fresh apples: food producers enjoy high status under the new order. A woman recognizes him from the television advertisement of many years before. She begins shrieking “mouthpiece, mouthpiece!” Daniel is quickly overpowered by nearby soldiers, a bag is placed over his head, and he is dragged off to prison. He sits in an overcrowded cell, watching as guards remove his fellow prisoners one-by-one. At last, his own name is called; a guard handcuffs him and ushers him into a room where an older man sits behind a desk. The man asks Daniel about the television commercial. It had depicted Daniel staring entranced before a plasma TV set at a Gadget Town outlet. A football player on the screen caught a touchdown pass and danced in the end zone. Daniel was shown mimicking the football player, but was directed to make his dancing “goofy, awkward and stilted.” The multiethnic customers in the store are shown disdainfully shaking their heads at the white man’s lack of both dignity and dancing skills. Daniel responds that it had been necessary for him to earn a living. Daniel is unable to think of an answer. When it became clear that nothing was forthcoming, the man behind the desk declares: “This court finds the accused guilty as charged. It has been proven that he was indeed a mouthpiece under the former régime, and as such is an enemy of the people who suffered under its whip. The sentence is death by hanging.” Only at this moment does Daniel realize that this had been his trial. This story is mirrored by another one concerning a movie star. Matt Weber, who does not take much stock in either fathers or battles, has been filming Our Fathers’ Battles in rural North Carolina. He employs a personal vegan chef whenever he is on location, because eating flesh is “disrespectful of the body;” at the same time, he has nothing against cocaine or sexual promiscuity. Driving away for the weekend in his new Ferrari, he crashes in a rural area and seeks help from the locals at a tiny bar. It does not take him long to insult them, and the author gives us his word that the final results are the best entertaining the actor has ever done. The art stories deal with the fate of art and artists in the modern world. Three of these are concerned in some way with a fictitious nineteenth century Alsatian painter named Edvard Adolphus. The first, called simply “The Painter,” purports to be a biographical sketch of the artist from The Catholic Journal of Cultural Studies, a publication difficult to lay one’s hand on. Adolphus began his career with a celebrated crucifixion scene which became the subject of odd rumors: tiny details were alleged to be keys to blasphemous secret messages. Supposedly, he had called Christ “an anomaly in the natural world, a living creature that won’t try to defend itself,” and mocked Christianity as “a cult of weakness and lunacy.” The artist did nothing to discourage such speculation. The painting was quietly got rid of, “donated” to a German church in Valdivia, Chile. Adolphus continued to épater le bourgeois throughout his career, lampooning wealthy capitalists and becoming a disciple of Max Stirner. Having reached age sixty, he travels to Africa and disappears. All but three of his works are said to have been destroyed in the firebombing of Dresden. The second story in this series, “The Confession,” is the longest in the book and occupies a central place. Brian Scheibe is a widely traveled businessman who has begun structuring his travel around a desire to see things which are disappearing from the earth: going to Uganda, e.g., to look at the silverback gorillas. The painting was by Edvard Adolphus, whom Brian had never heard of. He soon learns that the only other Adolphus painting on public view is a crucifixion scene at a Cathedral in Chile. Within hours, he is off to Chile. [Life’s enjoyments consist of] reading, music, fine arts, travel, the enjoyment of nature, sports, fashion, social vanity (knightly orders, honorary offices, gatherings) and the intoxication of the senses. For the majority, the border between higher and lower levels seems now to be located between the enjoyment of nature and sports. But this border is not firm. [E.g., the ancient Greeks treated sporting events as sacred occasions.-FRD] For medieval man the border lay, in the best of cases, right after reading; the enjoyment of reading could be sanctified through striving for virtue and wisdom. For music and the fine arts, it was their service to faith alone that was recognized as being good. Enjoyment per se was sinful. Alfred’s devotion to “the fervor of life” implies an emphasis on procreation, and the new friendship is strained when Alfred reprimands Brian strongly for not having fathered children by the age of thirty-three. Brian eventually challenges Alfred on the same point, and the old man admits to being childless. It is this, he says, which makes him so emphatic about the importance of family when speaking with a younger man. The parent is an artist who works upon the spirit of his child. “It is the mightiest endeavor, being handed a piece of clay or a blank piece of paper and bringing forth something from where previously there’d been nothing. From this seed, this rare quality of creativity possessed only by artists, springs all higher civilizations. It is that which whispers the infinite possibilities of what man might someday become. If those who possess this ability fail to have children…” His voice trailed off. We may note that for all his jabs at modernity, the author assumes here an entirely modern understanding of art: it is creation ex nihilo rather than the imitation of natural forms. Modern “promethean” anti-Christians (Nietzsche) who claim to find this ideal realized in pre-Christian art are projecting: Christianity inherited the concept of art-as-mimesis from the pagan world without essential change. The author’s writing is certainly open to criticism. For example, following the condemnation of Daniel Hoover in “The Stage Show,” the judge is depicted musing silently about why no actor brought before him ever mentions Shakespeare. For this, the judge feels lucky; he would not feel as confident sending them to their deaths if they did. Obviously, the author is trying to assure his readers that Hollywood is his target rather than the dramatic arts per se. But the passage is awkwardly inserted, and evinces a lack of artistic self-confidence. That said, Men–Art–War remains itself an illustration of a lesson implied in a number of its stories: that decadence is not a fatality, and the virtues of the race can find expression in any age. Published: December 30, 2010 | This entry was posted in Uncategorized and tagged art, book reviews, creativity, cultural rebirth, decadence, F. Roger Devlin, Men-Art-War, Mikulas Kolya, North American New Right, philosophy of history, reprints, war. Both comments and trackbacks are currently closed. Unfortunately much of Boyd’s work is no longer easily accessible on the net, but these few documents will give you a good taste of how a brilliant military theoretician thinks. Be sure to dig into what he calls “OODA Loops”, a symbolic expression of Action Theory which has many ideas useable in “Mind War”.